Since coming to work at NEHGS, I’ve been surprised by how often people tell me about their own genealogical research when they learn where I work. They usually tell me I’m so lucky to be working here, and say how they would love to work at such a place. I expect part of this sentiment is due to the belief that we have plenty of time to take advantage of the tremendous resources we have access to, but as passionate as most staff are about genealogy, their own research has to wait until the end of the work day, at which point the demands of life may also prevent people from getting to their research. So we’ve revived a previous practice of choosing a night when the library remains open to staff only until 9 p.m., enabling everyone from genealogists to the financial team to set aside dedicated time for tracking down ancestors. Maybe it was the lure of free pizza, but recently about twenty-five staff members attended the first quarterly event to conduct their own research in a fun atmosphere where colleagues exhibited the same helpful nature they offer our members and guest visitors during regular business hours. As NEHGS members know, much work can be done remotely from our home, or office, computers, but staff headed up to the library floors to research from the public computers and pull out books from the stacks. 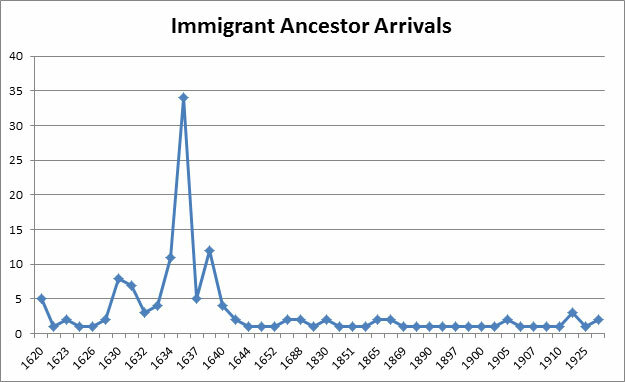 My own goal for the evening was to contribute to the new Immigrant Ancestors of NEHGS Staff database, to which staff can add the names of their immigrant ancestors along with birth and death dates, the date they arrived in America, where they lived before emigrating, and where they first settled. The idea is for NEHGS members to find common ancestors (several cousins have already been identified) and ancestral homes. 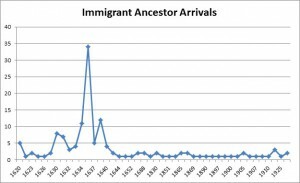 An aunt had already found the information for my Weston immigrant, John (1631–1723), and the death date (1698) for his wife, Sarah Fitch, but I wanted to find Sarah’s birth date and also determine whether she was an immigrant ancestor or was born here. So after learning that she was born in St. Albans, Hertfordshire, on 20 July 1633, I was happy to add her to the database, where she is listed among 313 other staff ancestors so far. I wonder how many there will be after the next research night! Thanks for the chart. Wouldn’t you know it Robert WHEATON arrived in 1636! I have been pursuing his origins for 42 years! Your John Weston and Sarah Fitch names rang a bell with me and, when I checked my database, sure enough, they are also my ancestors. The initial research on the Weston (and related) families was done in the 1940s at NEHGS by Raymond KInsman, a cousin of my grandfather. Ray lived in Boston at that time. He referred often to the papers of Gertrude Weston. which he found at NEHGS. as a source of information on the Weston family. My later efforts to locate these papers at NEHGS have been unsuccessful. Perhaps, being on the scene, you will be able to locate them. Thanks for posting, Lethene–nice to meet a relative! You’ve certainly made me curious, so I’ll see what I can find out . . .
No Roll-Out link from main page for Staff Ancestors. No link from here that I see. No link from Our Staff. So, where did you hide it?